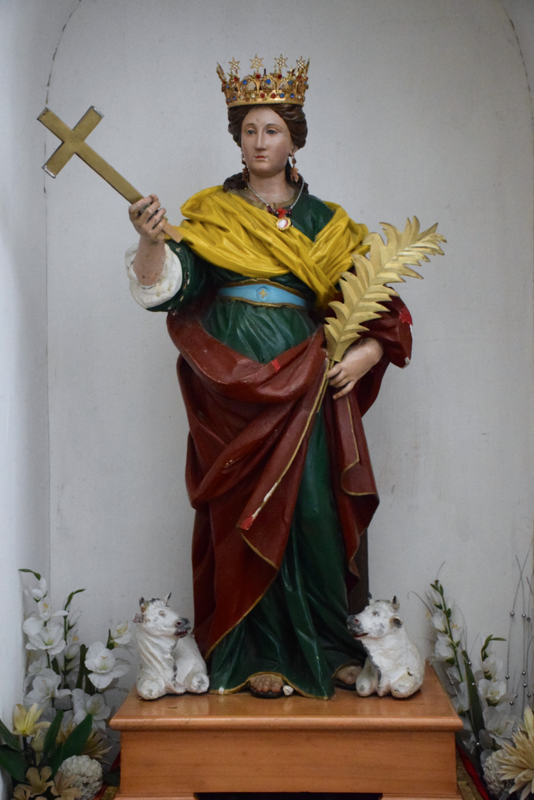 In the nineteenth century at the same time as the discovery of the remains of Saint Trofimena, virgin and martyr, the first short biografy of her life was written. It was added to and enriched in the sixteenth and seventeenth century by traditions and popular culture. And, only recently contributions of relevant new theories, have given substance to the history and life of Saint Trofimena. For the first time these theories have undergone critical examination. From these biographies we can see that the worship of this Saint has a long tradition. Her sacred body has preserved in Minori since 640 a.d. She is protector of the village and has a place in the heart of everyone in Minori. Native in the city of Patti (Messina), was martyred in the reign of Diocleziano and Massimiliano in the year 304. Hagiografycal tradition introduces her as the daughter of a nobleman that wanted her to marry, in turn, a situable nobleman. However he didn't succeed in fullfilling his desire and at the same time mortally wounded his daughter. Many version of the legend continue to talk of the escape and martyrdom of the young Saint. Among the most interesting is that of G.B. d'Afflitto, who writes:" The Virgin Saint knew that, stayng at home she couldn't disobedy the strong will of her father, and, inspired by God, she escaped from her father's house. Her father, however followed her and eventually caught her near the river Bocca in Tinnaro, four miles away rom the city, today known as Bocca of Marinello. Just before her father was going to beat her, the innocent Colomba, sent by God, came down, opened her wings, covering the entire water of the sea so the Saint could jump onto them. Thus providing the only method of her escape and therefore being saved from her persecutor"
A woman who was washing her clothes in the mouth of the Reghinna Minor river recovered the body of the Saint on the beach in Minori in a cinerary urn. She had just beaten her clothes against the marble, when, on the sight of this wonder, her arms froze, became rigid. Afraid, she asked for help. As soon as the discovery of the news spread, the bishops and priests of Amalfi and Naples came to this place as everyone proclaimed it to be a miracle. After a short time it was possible to see that on the top of the urn verses were inscribed that described the life and death of the Saint. They holy men decided to move the urn into the church, but it was so heavy the strenght of so many men was not enough to lift it or even move it. "Bishop Peter, inspired by God, commanded that two virgin heifers be bought to the urn. As soon as the heifers arrived the urn moved suddenly and quickly towards them. It seemed as if they were being pulled." This story explains the representation of two heifers on the urn of the Saint. A second "moving" of the body happened in 838 a.d. in the reign of Sicardo, Prince of Benevento. The Prince wanted to steal the remains of the Saint in order to make his church more important. The Bishop of Amalfi, afraid of this decided to move the body of the Saint to his cathedral to be certain. An anonymous writer:" claims that when the sacred relics were opened an incredible smell watfed into the air and spread far and wide, even to the beach." Something prodigious, then happened:" While Bishop Peter was holding the body many people poured into the church to touch the body, so full of passion that they were destroyng the body. However, it is at this point that it is believed that the Saint is yet again martyred. This event became well known, as it was incredible that after all the attention the body was still intact. From that day the number of pilgrims visiting the church grew." The third "moving" of the body was from Amalfi to Benevento and the fourth from Benevento to Minori, by intercession of Orso, the bishop of Benevento, and Peter the second of Amalfi. Many stories and miracles show the protection the Saint has given to the city of Minori. An anonymous writer:" claims that he was there and saw with his own eyes and touched with his own hands, the miracles that God performed trough the Saint." People say that a man called Bonaventura Magnasco, a sailor returning to Italy after many years of slavery in 1623, witnessed the protection of the Saint. He was a slave on a Turkish boat and the legend of the Saint was well known to the Turkish sailors, so much so that they avoided Italian beaches whrever possible. The worship of the Saint is deeply entrenched in society. So great is the faith of the people of Minori that they celebrate in her honour three times a year. The body of the Saint is still safe in the crypt of a church, which is named after her. It is perhaps strange to celebrate a Patron Saint every year. The people of Minori are even more unique however in that they celebrate their Saint three times a year the thirteenth of July, the fifth and twenty-seventh of November! The first date is to rimember the return of the body of the Saint to Minori after its theft by Sicardo. This traditional celebration is the most important in the entire south of Italy. There are lights, fireworks and concerts. The fifth of November however is the day in which the death of the Saint is celebrated and is called "A castagnara". As this celebration falls in autumn it is the time of year when chestnuts are rife, they are often eaten at the celebration. There is also a procession in the morning. November the twenty-seventh is a very special celebration, we need to look back to understand why. After Sicardo's theft, people from Minori were afraid of others stealing the body and so they decided to hide the body even further behind the altar, which was the place Sicardo would have surely looked. All the people who hid the body promised not tell anyone, to take their secret to their graves. Much later when the people moved the altar they discovered that the body was not there, they prayed for ages but found nothing. The people prayed and made offerings in the hope that they would find the body. On the twenty-fourth of November they decided to look again. They dug for three nights and on the night of the twenty-sixth/seventh; finally they found the urn with the Saint's bones. This finding made everyone extremely emotion and the church bells rang out to celebrate. All the villagers went immediately to give thanks and to this day mass in given on the twenty-seventh. There is no ritual procession on this day, but the image of the Saint is placed on the front of the church. The mass is taken at dawn and later lots of music is played to remind us that Christmas is coming. The zampognare very evocative and there is a special bonfire on the beach while a small procession passes by. This celebration is called "A Salsicciara" as it happens while pigs are being slaughtered.